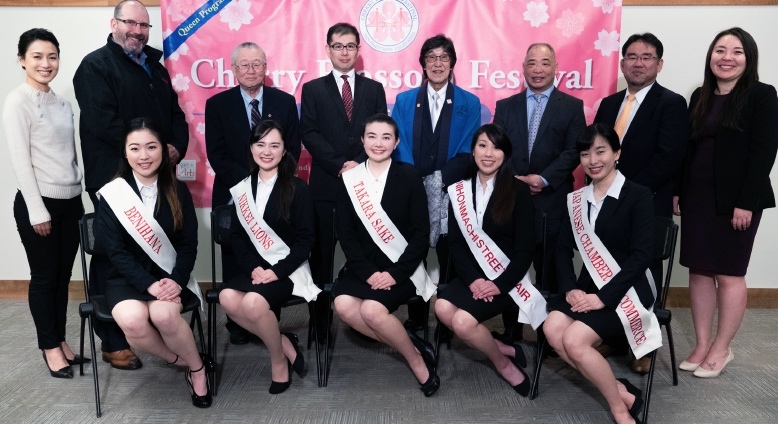 SAN FRANCISCO — The Northern California Cherry Blossom Queen Program introduced the five 2019 queen candidates on March 10 at the Union Bank Community Room in San Francisco Japantown. The new queen will be selected on Saturday, April 13, the first day of the 52nd annual Northern California Cherry Blossom Festival. 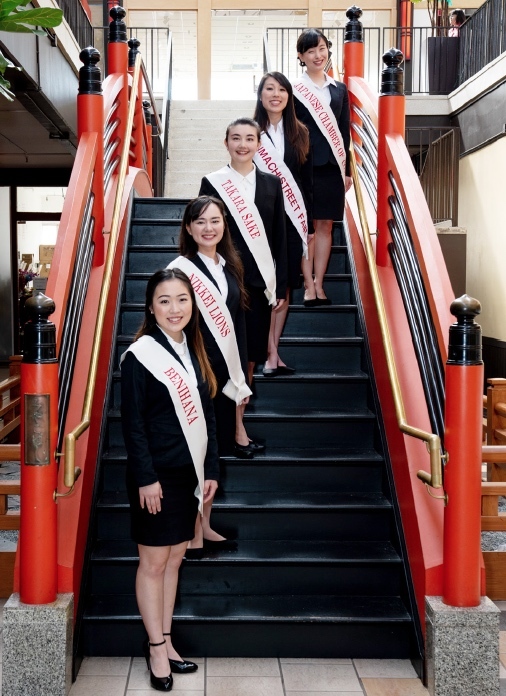 The new queen and court will serve as goodwill ambassadors for the Northern California Japanese American community at various events throughout the year, including the Nisei Week queen coronation and parade in Los Angeles. Queen Program leaders and candidate sponsors (back row, from left): Asaki Asato, Queen Program co-chair; Geoffrey Perry, general manager, Benihana; Steve Hirabayashi, president, Nikkei Lions Club; Shigeki Azuma, senior manager of sales and marketing, Takara Sake; Benh Nakajo, Queen Program chairperson emeritus and advisor; Richard Jue, chairperson, Nihonmachi Street Fair; Manabu Hotta, first vice president, Japanese Chamber of Commerce of Northern California; Yuka Walton, Queen Program co-chair. 2019 queen candidates (front row, from left): Nami Katie Saito, Elena Anne Harumi Nielsen, NaOmi Leilani Furukawa, Stephanie Reiko Gee, Yuki Nishimura. Following are profiles of the candidates. Stephanie Reiko Gee is 26 years old and received her bachelor’s degree from San Francisco State University. She works at UC San Francisco as a clinical laboratory scientist. Her hometown is San Francisco and her hobbies include dancing, baking, hiking. She is active in Nihon buyo and is a member of the Michiya Hanayagi Dance Group. She volunteered as a tutor for San Francisco State University GEAR UP. Nami Katie Saito is 18 years old and graduated from Sacred Heart Cathedral Preparatory. Her hometown is San Francisco and her hobbies include basketball, spoken word and making music playlists. She currently works at American Eagle Outfitters as a brand ambassador and sales associate. She is team captain of the SF Enchantees, an Asian League Basketball team, and served as class president and sports coordinator of the Japanese Language and Culture School (Hoshuko). She also is a member of the Buddhist Temple Youth Association. Elena Anne Harumi Nielsen is 27 years old and received her bachelor’s degree from UC Berkeley. Her hometown is Clayton, Calif. and her hobbies include singing, traditional Japanese dance, ikebana, taiko, sketching and taking pictures, and trying out new recipes she finds online. She worked in Tokyo for three years as an English teacher and returned to California to pursue a career in law, politics, or nonprofit work. Nielsen is the co-founder of Japanese Americans in Japan and volunteers as a phone counselor for Tokyo English Lifeline. She is certified intermediate in the Koryu School of Ikebana and is a member of the Diablo Japanese American Club in Concord. Sponsor: Takara Sake USA Inc.
NaOmi Leilani Furukawa is 24 years old and received her bachelor of arts from San Francisco State University. Her hometown is Davis and her hobbies include cooking, dancing, reading, singing, travel and exploration, and hiking. She works at Takara Sake USA Inc. during the weekends as a Tasting Room associate, facilitating group tastings and providing customer service. She was a member of JSA (SFSU) and the International Education Exchange Council, where she was an exchange student buddy for Japanese students studying in the U.S. She studies Nihon buyo with the Onoe Ryu and performed in their program “Dancer from Japan” at the Kennedy Center in Washington, D.C. in January 2018. Yuki Nishimura is 26 years old and received her bachelor of science from the University of Toronto. Her hometown is Sendai, Miyagi Prefecture, and her hobbies include naginata, rock climbing and singing. She currently works part-time in a lab at Stanford University, where she manages administrative matters, Japanese translations, and hosting guests from Japanese governments and universities. She is active in the Northern California Naginata Federation as a member and competitor for the past year and a half. She was the first-place winner of U.S. Naginata Championships, Mudansha Women’s Individual Shiai for 2017 and 2018. Nishimura is currently a member of the San Jose State University Kendo and Naginata Club.